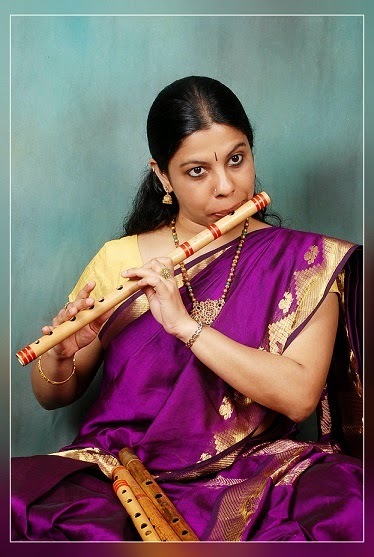 Richmond Rasikas is proud to announce a Carnatic Classical Flute Concert by Shantala Subramanyam, as part of their 2014 Spring Concert Series. Shantala Subramanyam, born in Bangalore – India, was immersed in music right from her birth having born into an illustrious music family. She was initiated into formal training in Carnatic [South Indian] Classical vocal music at a tender age of 4 and she took to playing the flute when she was about 11 years old. It was her good fortune to be trained by eminent performers -vocalist Late Sri. Vairamangalam Lakshminarayanan and is currently pursuing vocal music training under Sri O.S.Thyagarajan and Sri Sriram Parasuram. She gratefully acknowledges the contributions of famed South Indian drummers Trichur Sri.Narendran, Patri. Satish Kumar and Parupalli Phalgun towards enriching her rhythm training, spread over a decade. Her brother Shashank and father M.N. Subramanyam nurtured her talent carefully assuming the role of a teacher. Please listen to her tracks here: www.soundcloud.com/Shantala-flute.